By Paul LaViolette | January 3, 2014 - 9:13 am | April 16, 2014 Astronomy, News! Figure 1. 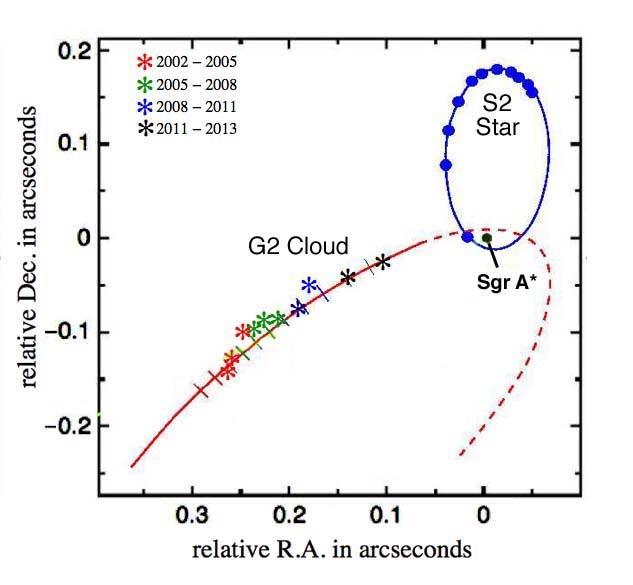 Trajectory of the G2 cloud as it nears the Galactic core. About 45% of all one solar mass stars are observed to have a binary companion star, about 60% of all 10 solar mass stars are seen to have stellar companions, and about 75% of all 30 solar mass stars have companion stars. So for the stated mass range for the G2 cloud star, there is about a 50:50 chance that it will have a stellar companion, and if it doesn’t have a stellar companion, there still remains about a 100% chance that it will have a giant planet or brown dwarf companion. So the situation is beginning to look pretty serious. Papers published so far on the G2 cloud have failed to discuss the possibility that an embedded star might carry with it a companion. And yet this is the most important aspect to consider in this upcoming cloud-core encounter, because tidal stripping of a companion star and entrainment into the Galactic core would almost certainly trigger a core explosion with consequent prompt superwave impact on our solar system. Whether or not the companion star is stripped away will depend on whether it orbits outside or inside the primary star’s L1 Lagrange point, the point of no return beyond which orbiting dust, planets, or companion stars come under the influence of the Galactic core’s dominant gravitational pull. The L1 point is located close to the star on the side facing the Galactic core; see Figure 2. If a companion star orbits its primary star at a distance closer than this L1 point distance, it will remain under the influence of the primary’s gravitational pull and remain bound in a binary orbit. If not, it will enter the core’s Roche lobe and get sucked in. Figure 2. 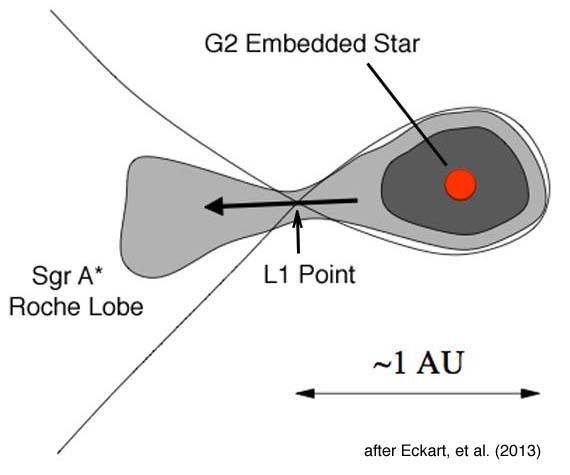 Illustration of the L1 Lagrange Point in relation to the G2 star. The statistics do not look to favor the companion’s survival. Binary stars are separated from one another on average by about 8 astronomical units (AU), although they can be located as close as 0.1 AU in very close binaries. By comparison, Eckart, et al. note that when the G2 cloud is at periastron distance, and if its embedded primary star has a mass of one solar mass, its L1 Lagrange point will be positioned about 0.1 AU away; if the embedded star is an 8 solar mass star, its L1 point will lie further out, about 0.5 AU away; and if the cloud contains a 30 solar mass star, its Lagrange point will lie still further out, about 1 AU away. So with the Lagrange point being so close to the primary star (0.1 to 1 AU), the chances are that when the G2 cloud makes its closest approach to Sgr A*, the companion star will be orbitting outside the L1 Lagrange point and within the Galactic core’s Roche Lobe. This means that it will almost certainly be stripped off and end up getting pulled into the core. If the tidally stripped body is of lower mass, such as an Earth sized planet or jovian planet instead of a star, then it is likely that the triggered core outburst will be much smaller. How large or small cannot be said. There is no way to predict. At periastron, its closest approach to the Galactic core, the G2 cloud will be somewhere between 125 and 200 AU from the core following the highly eccentric orbit shown in Figure 1. At its closest approach, it will come about as close to the core as the S2 star, when that star is at periastron. Since S2 makes has an orbital period of a bit over 15 years, it has made many close approaches to the core in the past centuries with no serious consequences. Since no outburst activity was observed when the S2 star passed close to the core in 2002, one might ask whether we have anything to worry about from the G2 cloud. For the S2 star to make repeated passages of the Galactic core with no noticeable consequences, we may conclude that it is a single star and that any companion objects such as stars or planets were long ago stripped away by the core’s gravitational field. In fact, it is possible that S0 is the remnant of an inbound star system which had its companion mass stripped off some time in the past and resulting a core explosion. For example, it may have triggered one of the 13 minor core outbursts that took place in the past 5300 years. The G2 cloud, however, is making its first pass of the core, and the statistics are stacked in favor of it having a companion. Tidal stripping will be most likely begin to occur when the G2 cloud has reached its periastron, point of closest approach to the Galactic core. Based on predictions of various authors, this is most likely to occur sometime between March and May of 2014; see Table 1 Once we see the G2 cloud divide and a mass split off, we will only have about four to five months two to three weeks before the mass reaches the core surface and triggers an explosion. So we should keep close watch should something be about to happen. The research that went into the preparation of this posting was financed by the Starburst Foundation. Those who feel that these G2 Cloud postings are of interest and of general importance please visit the Starburst Foundation website and make a donation. Thank you Paul, I will look forward to future insights. Talking about ascension Paul I have a big story to tell that has happened to me in the last months, because the connection is the heart to the brain or to the pineal gland, and to have this opened heart is something individual, we have to have much inner work done. Something has happened to several persons in january and to me even more drastically they had it at home, meditating and someone also had it with a stange incident, but not as strange as mine, but wonderfull it helped me help my father died a few weeks later. I had a flash of DMT driving in the highway and I hit the brake really hard because it blinded me. When I gor my sight back the car was out of control hit the side of the highway turn around and went back 200meter agains the direction of the highway, noone came, if they hit me they would have killed me. noone saw me get out of the car and they just saw a women running looking for her cat, I found him nearer the place of the crash, we were both intact. Then I was able to get a brainscan that week and the neurologist told me that they know about these flashes they happen before death and they have a relationship to the heart. So she confirmed my research of the connection of the heart with the pineal gland, a spark goes up the vega vein and produces DMT in the pineal gland. Next day my father was not sleeping any more in the hospital, he was hiperventilating so i decided to place a hand in his heart and the other in the top of this head and his breath was shocking and i took the hand of the head, but after a while I decided I had to help him I did the same he had a long breath and that was it. It was utterly wonderful and so easy for him and for me, I know I helped him out of few hours of agony. And the best it confirmed me all my research about the pineal gland, the thymus heart connection and also the evolution of the sphenoid bone as evolving and this superwave will do this Paul I do not doubt it, If it comes now or later. I did send you a pdf of my research about evolution and the changes in the Hioide bone in the throat responsible of speech, the sphenoid bone and the Etmoid bone. Hope you read it because this will happen later in time. THANK YOU SO MUCH PAUL FOR KEEPING US INFORMED. IT IS VERY VERY IMPORTANT. thank you very much for your informations ! why should we worry about the core explosion NOW ? As this event will happen at a distance of about 25,000 light years away from us ? Or does that mean that this explosion did happen already 25,000 years ago, and that the high-energy wave will arrive HERE the exact same moment we saw the explosion up THERE ? As someone not familiar with the macrocosmos, it’s hard to think in those stellar dimensions ! And do you think that this explosion has anything to do with the many crop circles, like f.e. the ones from June 8 and June 15, 2008 in Wiltshire ? Others have asked this many times before. You (and they) should not be asking this question! You should be reading my book Earth Under Fire so I don’t have to keep answering it. If I had to answer this question for 1000 people for example, multiply that by the time 10 minutes taken to write up a reasonable answer to the question and already you have three weeks of full 8 hour days. This is why people publish books, so that they have to explain it only once. To answer very briefly, it is 23,000 light years not the astronomical convention that the media report as 25,000 light years. The cosmic rays travel to us essentially as fast as the light event horizon. Read my book if you need more of an explanation. Unfortunitaly it seems there is a lot known to few and unknown by many. I am not sure if you have the power to do so, but I suggest warning the public of the ascension logic you have put forward. It is essential for the public to know before ascension events occur, for example stop writing contacts or glasses, for time dilation will occur greater in those with corrected vision. As our bodies ascend and clear themselves of sin, the spots on our bodies will fade and cancer will die, our vision will be corrected and we will awaken to a dream filled with joy and near infinite possibility. Likelyif one were to tell the masses of the joy of ascension they will understand what has happened 13 times in our past, with the circa 13 long counts of the Mayan calendar. Thank you, good day. I like your depiction of this. It makes one want to adopt astronomer Leo Meyers’ view and optimistically look forward to “fireworks” actually occurring. Perhaps you meant stop wearing contacts or glasses? Am not sure what that has to do with experiencing a time dilation. Anyway, what you say should apply to what everyone will experience at the time of death, whether it be from a superwave event or to some more mundane occurrence. Hopefully most of us will experience this ascension when it comes our time to pass over. Thank You so very much, for your fortitude Paul in the attempt to bring this information forward to the general public. I find it so relevant that as 12/21/12 approached, the media let all the “End of the World” scenarios flood the Internet and therefore the collective consciousness of the world. Well nothing happened. Now that there is a more scientifically proven threat with equal results, there is not a peep of this danger anywhere but from you and those willing to get your message out. That fact alone raises my “red flags”. With that said, I do have a question, As I understand it, the G2 cloud is so thick, that there is extremely high potential if not certainty, that there is a star in this cloud. However, the density of the cloud is preventing your sources from being able to detect a binary companion whether that companion is another star or planet(s). My question is, since it is getting close to the time that the G2 cloud will start being eaten by the Galactic Core, if it hasn’t already, then wouldn’t a stripping of the cloud eventually cause enough thinning of the cloud to peer into it better and ascertain what is “actually” in it? And if this scenario did in fact occur, and it was determined that there was a large enough of a body in the right position, to actually cause a massive wave, would there be enough time to sound the alarm whistle to those who want the most preparation time? Or, would there really not be a distinctive difference? maybe a day or two extra of warning? Thank You for your time if you choose to answer this, You have been my favorite scientist for many years and it is an honor to finally be able to actually ask you a question. The G2 cloud will not likely thin out much more than its present opacity when it becomes tidally elongated during its pericenter encounter with the Galactic core. This is because it is continually being generated by gases being thrown off by the star hidden within it. This is something that the GC astronomers have not yet realized because their theories are not up to par to understand this. The star or stars hidden within G2 are extremely bloated and losing mass at a very high rate due to 1) internal genic energy production and 2) extreme heating of the stellar atmospheres by the GC cosmic ray fun; see news discussion; see the following G2 cloud posting. Here in the following Swift telescope posting I explain that we may have a one day warning before a potential event. In my January 23rd posting I suggested that we may have an earlier warning if the G2 cloud is seen to divide in two as the companion star is stripped off. But the separating companion cloud is likely to be very faint in difficult to detect. If it is instead a jovian planet that is stripped off, we may see no secondary cloud at all and have no early warning. Anyway I have had concurrences from three astronomers that they will notify me if there is any dividing cloud phenomenon detected. I appreciate all the information. Any thoughts that this “wave” could be associated with Ascension as the energy would be of a higher vibration than 3D? The gravitational component could have a profound psychological/psychic effect on people. Townsend Brown in the 1930’s found that variations in the local electro-gravitational force not only correlated with the relative position of the Galactic center in the sky, but also with stock market trends. His data which was gathered while he was working at the Naval Research Laboratory and has remained so secret that the Navy does not even acknowledge its existence. So all efforts at FOIA retrieval have been fruitless; see my book Secrets of Antigravity Propulsion. The superwave will be initially charge balanced. But depending on its ratio of positrons to electrons, it could in later hours develop a negative charge bias as the slower proton component progressively lags behind. Negative charge has therapeutic effects, much like negative ions from an ionizer. So this aspect could be beneficial. But there are also far more exotic effects that could be produced. Negative charge correlates with a positive shift in gravity potential (an effect understandable only within the subquantum kinetics physics paradigm). So the longitudinal gravity wave accompanying the superwave would initially produce a rise in G potential. If the local G potential where to rise very significantly, solid objects could begin to appear transparent, and in an extreme case could become invisible, as occurred in the Philadelphia Experiment (see Secrets of Antigravity Propulsion). I am not saying that a superwave would definitely do this, as we have not ourselves experienced this in modern times. About a dozen minor superwaves (less than a day duration) have passed us in the past 5300 years and as far as I know there are no historical accounts of paranormal effects occurring in connection with them. If Ascension-like effects do occur, I would attempt to explain them in this way as an effect of the change of the local gravity potential and possibly the G ether wind that would accompany it. This second effect is understandable would involve an intense flux of G etherons hurtling towards us from the Galactic center. It would be an ether wind effect similar to as if we were in a spaceship traveling rapidly through space toward the Galactic center, although in reality a gravitational force would be at the same time pushing us away from the Galactic center. Depending on the magnitude of this ether wind flux, one might even experience some prolonged period of time slow down (similar to relativistic time dilation). Again, this is only speculation, as no such effect has been reported for the events we experienced in the past five millennia. I only mention them in the way of possibilities in order to address this present question. Can you review what will be the next event that will happen in the M82 galaxy, which is much closer to our galaxy? M82 also has a binary system in its core. If you are referring to the unusual bright superluminal radio source moving out from the center of M82 at the apparent speed of about four times the speed of light, I will make a posting about this in the next few days. This event offers very strong evidence supporting the galactic superwave concept. M82 is quite close, only 11.5 million light years away. So by observing it, it is possible to get better information on core explosions than we could get by observing more distant galaxies. Thank you for making people aware of this phenomenon. I have read all your books, including Subquantum Kinetics. I just wanted to say that your theory makes a lot more sense than what we are being told from mainstream science. Everywhere I am reading, they state that the core consists of a black hole, as it’s been proven beyond doubt. Thank you for a very interesting topic. I am an educated person, but not in this field so I am struggling to understand this science. However, I am going to read more about this subject and learn. Thanks for waking me up! Thank you Paul for precise work! Could you please share your oppinion about Europe? Some places will sink or? I have no way of knowing if a superwave will definitely occur this year or if it does whether it will cause coastal flooding as occurred in parts of France some weeks ago due to severe weather. I don’t see any sinking of land as a possibility. Good Day Dr. Laviolette, could you please quantify “Likely”? If it is possible to do it. Thank you so much, I really appreciate your job. I hope to address this point in an upcoming update that is in the process of being prepared. Watch the news section. An accurate answer of your question requires computer modeling. Have inquired of three GC encounter modeling groups and none have responded. So an accurate answer may require viewers to contact these groups yourselves. Will try to provide contact information later. Do you feel there are any safe places on the East Coast if this happens? Perhaps you refer to homes along the eastern coast of the U.S. and might be concerned about the seismic effects of the arrival of the gravity wave component of a superwave? This is the most difficult aspect of a superwave to know anything about. Whether it will just cause increased earthquake activity, or will also produce a tsunami as occurred in Malaysia in 2004 is an open question. Unfortunately, any such gravity wave effect would precede the visual appearance of a superwave and hence would arrive without warning. There have been several movies popularizing the idea of a tsunami striking the east coast. Follow your intuition and try not to be over influenced by these cinematic images. According to some credible research there was a Tsunami event that carried ejecta into the Hudson River from the Atlantic Ocean ~2300 years back. These ocean materials were found in multiple cores taken in the Hudson River. Perhaps reading about these discoveries may provide some idea of the potential of Tsunami effects from a historical perspective even though the proposed Tsunami originated from an alleged impact event. Very interesting. Maybe Native American Indians, such as the Manhattoes, might have a story about it in their lore. I thank you for the information you are bringing forth. I commend your bravery for speaking the truth. Please keep us informed as this is the only place to get information concerning this issue. I live in NJ. About 50 miles from the coast. If the explosion should occur would it be your opinion that NJ would be wiped out entirely? I live very close to the Delaware River of which the Walt Whitman bridge crosses into Phila. PA. This bridge is almost entirely covered in rust. They no longer even try to cover it up with paint. I am pretty sure that with any light shaking of the earth the bridges will come tumbling down. If this happens I will be stuck in NJ. I realize there is no way to know positively but your guess would be greatly appreciated. We still don’t know if core explosion will definitely happen this spring. It is not good to be in complete denial but it also is not good to become overly panicked. We can only wait to see what develops. Of course, in any case it is always good to be prepared. If you have clairvoyant experiences with a history of being accurate, please contact the Starburst Foundation if you have any premonitions of any upcoming event that might be related to the G2 cloud – core encounter. The Foundation pays attention to ESP experiences and regards them as another mode of gathering information on a possible catastrophic event if they are specific enough. They may be considered as a form of remote viewing. Unfortunately, there is also a lot of noise (mistaken perceptions) involved in such inputs. One must also try to distinguish between actual perception and interpretations of the information made by one’s own mind imposing one’s own belief system. This is key. For example, your statements like the “Earth will flip on its side”; i.e a polar spin axis alignment change must be weighed against the geologic record which shows no such polar alignment changes over the past 140,000 years. This does not rule out polar jerks which could provide a substantial jolt to the planet without an appreciable pole direction change. Anyway recent news announcements such as FEMA requesting information on the availability of dumster services for the collection and removal of biomedical waste (infectious waste) during an emergency response event, do not give us much of a feeling of security in the coming months. To me, it has been a battle between insanity and reality. ALL of the evidence…. the extinctions 12,000 and 24,000 yrs ago, the mini ice age 300 yrs ago and the flaring seen reflecting off clouds 300 lightyears distant from the GC, from Dr. Svensmark showing the planetary impact of cosmic rays on cloud formation, and especially the global climate change right now…. Reality states that everything is cool. No way that the interglacial period is about to end. It is fantasy and paranoia to believe anything different! As we have entered a new era, where up is down and black is white, insanity has become the leader and anyone who is clinging to the old reality looks out of touch and off his rocker! Just look at the geo-social and political changes that are occuring… and fast, too! And I’ll bet, if we focus real hard, try and decide if within the last few years there was a ‘tipping point’… a point in time where we can say “That’s where it all changed”, we can see that the ancients really were aware of things we are only now starting to understand. I really wish I could donate, because your work has inspired me and brought me to the level of preparedness needed for my family. I can think of no other who has enlightened me more than you, sir. Preparedness is pricey and intrest is high! My deepest thanks and a reminder to you is all I can give… 4 people here will stand strong due to your passion and dedication. Stay strong !!! Keep fightin ‘ !!!! Hi Paul, thanks for the update. If the worst case scenario occurs and resulting superwave is a Monster. How would that compare to a head on zero degree inclination gamma ray burst from the WR-104 Wolf-Rayet star? How much of an increase in UVB radiation would the G2 superwave produce on Earth? It is difficult to speculate on UV intensity from a superwave. UV intensity would be a small fraction of the cosmic ray intensity. I would say that solar UV would be a bigger concern if superwave cosmic rays produced stratospheric ions that partially destroyed the ozone layer. But this is just speculation.